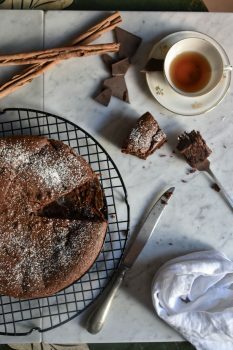 Torta caprese is a flourless chocolate and almond tart originating from the Amalfi coast. The classic recipe doesn’t call for the addition of spices, but this recipe is my favourite and very precious. I was given it by a very dear person to me. Moreover, during the Christmas period I reach very happily for vanilla pods and cinnamon to bake with. Start with melting the chocolate. Set a heatproof bowl over a pan of gently simmering water, a bain marie, (use a small amount of water and make sure it doesn’t touch the base of the bowl). Break the chocolate into pieces and put it into the bowl with the butter and allow to melt on a low heat stirring occasionally. In a separate large bowl whisk the egg yolks with the sugar until the mixture turns pale in colour. Add the grated almonds and mix well. Cut the vanilla pod length-ways and scrape out the seeds. Stir them in along with a pinch of cinnamon. Now is the time to add the melted chocolate mixture (be careful because the bowl used for the bain marie gets very hot). Pour a small quantity of the chocolate into the bowl containing the almond mixture and stir well. Gradually add the rest of the chocolate liquid whilst stirring all the time. In the meantime whisk the egg whites until they form soft peaks. Take a third of the egg whites and fold into the almond and chocolate mixture. Gradually fold the rest of the egg whites until obtaining a uniform mixture (don’t overwork it as you may lose the desirable air trapped in the whisked egg whites). Grease and line with a baking parchment a round loose bottomed baking tin, 26 cm in diameter. Pour in the mixture and even out its surface. Bake in the preheated oven to 180 C for around 40 minutes until the top appears to be dry. Don’t overcook this tart so it stays moist inside as it should be. You can test it with a dry skewer inserted in the middle. It should come out with a couple of moist crumbs attached to it. Let it cool completely in the tin before handling. Dust with the icing sugar moments before serving. A scoop of vanilla ice cream makes a perfect accompaniment and that is how it is often served on the Amalfi coast.